Recycling plastic parts of an old computer keyboard and turning keyboard buttons into small decorative objects, such as beads for a necklace or fridge magnets is a fun idea that helps protect the environment and design unique accents for eco homes. Old keyboard buttons make great wall decorations also. Inspired by wall decoration ideas from Sarah Frost, you can create unique wall decor on your wall, adding a personal touch to room decorating. Recycling plastic is a way to go Green. Recycling plastic parts of computer, keyboard buttons and a cable, and creating interesting and unusual wall decoration saves money also. Artist Sarah Frost, www.sarahfrost.info/ offers amazing and surprising wall decoration ideas. 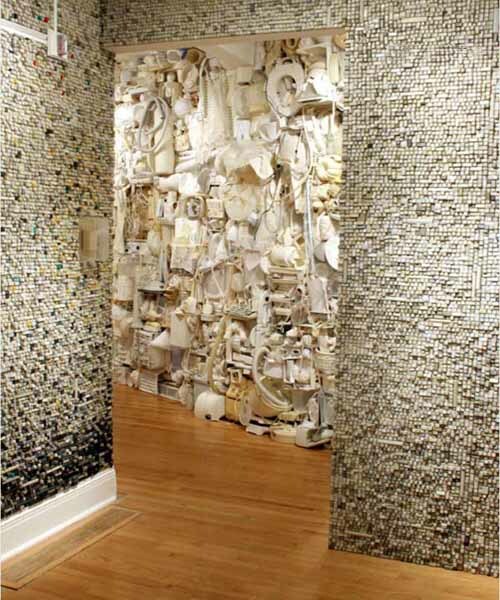 She used computer keyboard keys as mosaic tiles for wall decoration in a New York hotel. The artist is famous now, showing her unique ways of wall decoration at exhibitions throughout the United States. 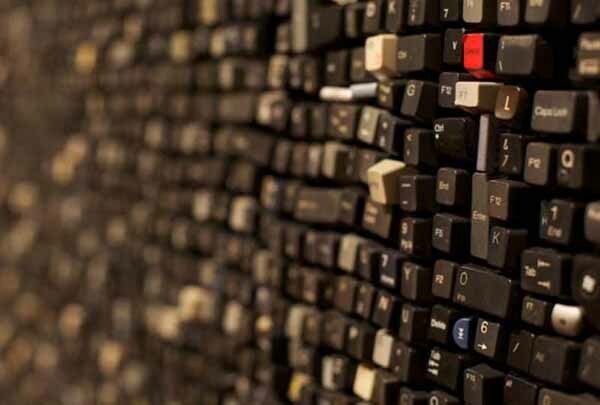 The artist believes that every old computer keyboard key is unique. Each has a history and bring the historic value into wall decoration, creating exclusive designs. If you get inspired, turn your old computer keyboard upside down and remove the small screws and the bottom part. Use a screwdriver to push out each key. If they are dingy, soak them in warm water with a few drops of dish soap, let dry on a paper towel and push out each key. You can create unique jewelry pieces or design very personal wall decoration. You can spell names, write words and sentences with the different letters. Recycling old computer keyboard buttons and making crafts are great wall decoration ideas for teens and kids rooms.